One of the leading figures of 20th-century art, Horace Pippin (1888-1946) is known for his insightful, expressive and bold paintings. The exhibition will examine the work of Pippin, a self-taught artist who remained independent-creating and upholding a unique aesthetic sensibility. Pippin vividly depicted a range of subject matter, from intimate family moments and floral still lifes to powerful scenes of war, history and religion. The Washington Post recently featured an article about the exhibit and Pippin, which can be read here. adhered to cardboard, 8 x 6 1/2 inches. 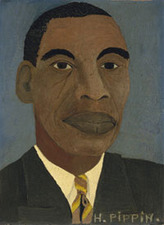 Horace Pippin: The Way I See It will include 65 paintings-close to half of the artist’s oeuvre-assembled from museums and private collections across the United States. The Brandywine River Museum of Art will be the only venue for this exhibition, the first major exhibition of the artist’s work in more than 20 years. Taking its title from Pippin's response to his own question about what made him a great painter: "I paint it exactly the way it is and exactly the way I see it," the exhibition will look closely at Pippin as a self-taught artist who remained independent—creating and upholding a unique aesthetic sensibility, vividly depicting a range of subject matter, from intimate family moments and bold floral still lifes, to powerful scenes of war, history and religion. Pippin was born in West Chester, Pennsylvania, less than 10 miles from the Brandywine, but grew up in Goshen, New York. He eventually returned to West Chester in 1920 after serving in World War I as part of the renowned African-American regiment known as the "Harlem Hellfighters." The war, Pippin would later declare, “brought out all the art in me.” Despite a war injury that severely limited the use of his right arm, Pippin created an illustrated journal of his war experience on his return home, and by 1930 had begun teaching himself to paint in oil using his left arm as a support for his right hand. Pippin painted in relative obscurity during most of the 1930s. Though his work was well known to his neighbors and sometimes displayed in local businesses, it was not until 1937 that his paintings gained wider public recognition when he exhibited two works at the Chester County Art Association's annual exhibition. Awarded a special mention by N.C. Wyeth, who was judging the show and helped ensure that Pippin's paintings were shown prominently, Pippin immediately garnered local press attention. Wyeth also persuaded the art critic and collector Christian Brinton to arrange for Pippin to have a solo exhibition at the West Chester Community Center, where the artist showed 10 oils and seven burnt-wood panels. Pippin’s rise to prominence was meteoric after 1937. The Museum of Modern Art featured four of his works the following year, and he was quickly embraced nationally by other museums, galleries, critics and collectors who valued the self-taught artist's style—characterized in his time as "primitive," or "naïve”—for its perceived pureness of expression. Patrons ranged from Albert C. Barnes and Edith Halpert to Hollywood figures such as Edward G. Robinson. Despite this general labeling of his work at the time as “naïve,” and Pippin himself as unsophisticated, the truth is quite different. Pippin was an astute observer of the world, and his paintings reflect his deeply personal connections to the issues that concerned him—such as peace and social justice—as well as his own experiences. The exhibition will present a comprehensive, nuanced examination of this seminal artist. It will reveal the richly varied sources of inspiration and traditions that informed the evolution of Pippin’s style, and will introduce Pippin’s fierce vision to a new generation of museum visitors. Horace Pippin: The Way I See It will be accompanied by a fully-illustrated catalogue featuring insightful essays by exhibition curator Audrey Lewis, and guest authors Judith Dolkart, Jacqueline Francis, Kerry James Marshall, Anne Monahan, and Edward Puchner. It will be available in the Museum shop and online in April. This exhibition is made possible by the Exelon Foundation and PECO. Additional support provided by The Davenport Family Foundation, Wyeth Foundation for American Art, and Dr. Benjamin Hammond. 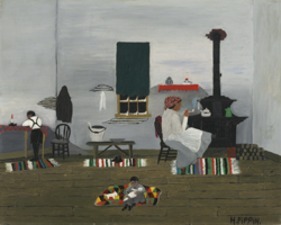 Visit sites in West Chester associated with Horace Pippin with this guide.